uuid : 11a8c8a1-4ee2-4053-bc59-98781eb5fd8f templates_id: 119505 templates_uuid: "6d1d4c13-7b39-4d27-84f4-634cd555cb05" title: "Settlement agreement (formerly Compromise Agreement) " display_name: "Settlement agreement" meta_keywords: "Compromise agreement and Employment settlement agreement" description: "
Negotiate with an employee from the outset and protect yourself from any future claims using this settlement agreement (previously known as a compromise agreement). A settlement agreement is a legally binding contract which waives an employee\'s right to bring a claim, normally in exchange for payment. Settlement agreements can be used in many circumstances including handling grievances, long term sickness, redundancy and performance management at work. 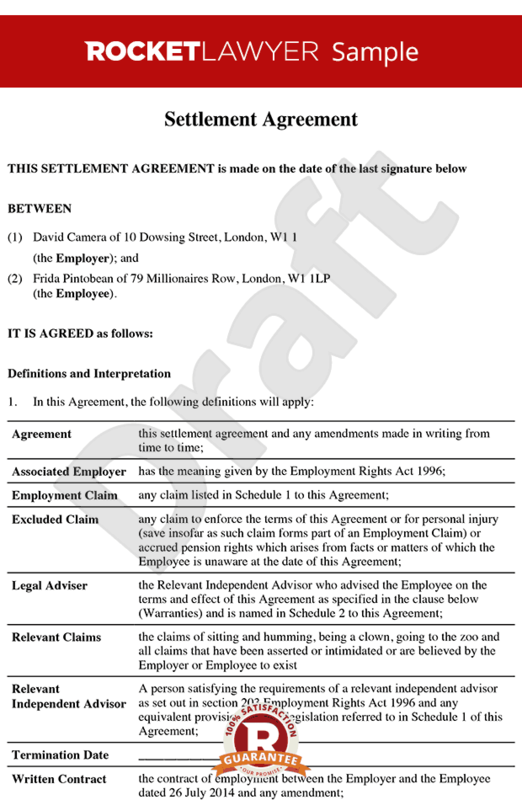 Use this legally binding settlement agreement to prevent taking a dispute to the employment tribunal which could be costly and have uncertain results. Severance arrangements must be recorded in writing and the employee must receive independent legal advice for the agreement to be legally binding. A settlement agreement is a legally binding contract between an employer and employee which details an employee\302\222s claims against an employer. It also contains agreed terms including when the employment will be terminated, how much compensation is offered, how the employee will serve their notice period and more. Why do you need a settlement agreement? An employer may need to use this agreement to settle claims in connection with: a departing employee\302\222s dismissal; to settle claims that had arisen before they left employment; or to agree terms on which an employee will leave employment and waive any associated claims. If a departing employee signs a settlement agreement offered to them, and they are advised as required by ACAS, they cannot take out a claim with the employment tribunal against that employer. You need this agreement to prevent your employee taking a claim to the employment tribunal, which can be costly and have uncertain results. Can you attempt to commence a settlement agreement after an employee has started an employment tribunal claim against you? Yes, you can commence a settlement agreement after your employee started a claim against at employment tribunal. Can this settlement agreement be used if the employee is still employed? Yes, you may want to agree with a departing employee the terms of this settlement agreement whilst they are still employed. How should you work out the amount to offer as compensation? How long should you give the employee to sign the agreement? You should give the employee between 14 and 21 days to sign and return the settlement agreement. This will allow enough time for them to obtain independent legal advice, as required by law to make the agreement valid. ACAS recommends ten days as a minimum amount of time. Should a reference be included with a settlement agreement? It is common to agree on a form of reference for the departing employee. This helps to avoid future disputes and can be included with a settlement agreement. This settlement agreement is governed by the law of England and Wales. In order for this agreement to be valid the employee must receive independent legal advice from a person who satisfies conditions set by law. Most solicitors will meet the necessary criteria.
" created_timestamp: "2018-10-08 04:36:29.0" modified_timestamp: "2018-10-08 04:36:29.0" active: true created_by: 236 modified_by: 236 dcm_id: 312 url_slug: "Settlement-agreement" meta_description: "Create a Settlement agreement (formerly known as a Compromise agreement) with simple step-by-step guidance from Rocket Lawyer. Negotiate with an employee from the outset and protect yourself from any future claims using this settlement agreement." time_to_complete: "20 minutes"
Negotiate with an employee from the outset and protect yourself from any future claims using this settlement agreement (previously known as a compromise agreement). A settlement agreement is a legally binding contract which waives an employee's right to bring a claim, normally in exchange for payment. Settlement agreements can be used in many circumstances including handling grievances, long term sickness, redundancy and performance management at work. Use this legally binding settlement agreement to prevent taking a dispute to the employment tribunal which could be costly and have uncertain results. Severance arrangements must be recorded in writing and the employee must receive independent legal advice for the agreement to be legally binding. A settlement agreement is a legally binding contract between an employer and employee which details an employees claims against an employer. It also contains agreed terms including when the employment will be terminated, how much compensation is offered, how the employee will serve their notice period and more. An employer may need to use this agreement to settle claims in connection with: a departing employees dismissal; to settle claims that had arisen before they left employment; or to agree terms on which an employee will leave employment and waive any associated claims. More than just a Settlement agreement template, our step-by-step interview and guidance makes it easy to create your document. Easily create online, download, print and sign your free Settlement agreement in minutes. This document is also sometimes called: Compromise agreement and Employment settlement agreement.